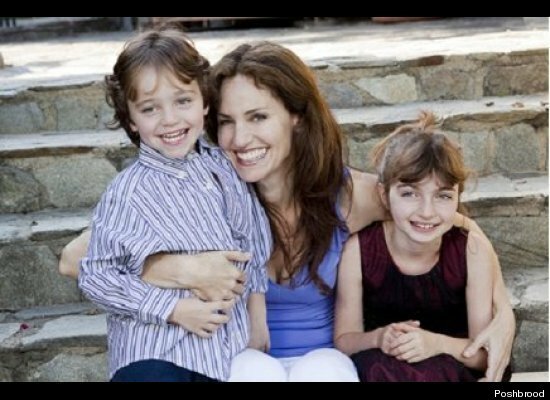 Poshbrood is thrilled to have a fabulous mom, activist and award-winning actress pen our first celebrity review! She's not a doctor but plays one on TV -- Amy Brenneman!! Amy plays Dr. Violet Turner on Private Practice and gets paid to make out with Timmy Daly. No fair. You can catch Amy on Thursday night on ABC at 10/9 Central, beginning on September 29th. Follow Amy on Twitter at @theamybrenneman. We recently booked Amy, her director-husband Brad Siberling and her two children, Charlotte and Bodhi at the Terranea Resort in Palos Verdes, California. She and her husband agreed to submit their review for Poshbrood and we think they did a fabulous job! In their own words, check out their Terreanea experience. "All in all, our experience wasn't as fabulous as we thought it would be. One of the main reasons being -- the weather. It was really cold. What we had envisioned was baking in the sun by the pool, being served drinks while our kids played for hours on the fabulous slide. Didn't happen. It truly was like the bay area -- foggy and chilly -- and the pool and slide were okay but not jaw-dropping. Also, although the hotel was really expensive, they truly seemed unable to deal with the full capacity of Labor Day weekend. We were told there was one restaurant in particular that was good for families -- Nelson's -- and we didn't need reservations. Saturday night when we showed up around 6 pm, we were told it would be NINETY MINUTES until we could get seated. Fortunately, we found another restaurant, where we were seated in about twenty. This is a major issue for families with smaller kids. Another real problem we had at Terranea, as a "family" destination, is that there was no drop-in kids center. At most other hotels -- Four Seasons, for example -- there's a room where there's stuff and it can be a good place to chill out if need be. But at the Tide Pool kids' club you had to sign up in advance, and when I called Saturday afternoon for that evening, it was already full. I asked if we could just drop by, play some games on Wii, and she said no, it was filled to capacity. I signed them up for the morning, but again, since it was more of a drop-your-kids-off situation, not a parents-and-kids-can-hang-together-and-play-pool situation, we never made it over. Upon check in, the lobby was beautiful, the staff lovely but the kids were not given welcome packets and we were not told what the family family events were -- I had to ask. THE ROOM -- This was gorgeous, truly spectacular. We were in a one-bedroom casita and there was a full kitchen, and if I'd known, I would've brought food to prepare. The casita also had a washer/dryer. We were in a casita away from the main lobby -- good news/bad news. Good news gorgeous room and ocean view, bad news because it was a wee schlep (or golf cart ride) whenever we wanted to get anywhere. Bed linens were KILLER yummy. I saw kids biking and scootering around the grounds, which looked really fun and safe. I would recommend that. The spa -- the spa was AWESOME. Beautifully run, great services. Bodhi and Charlotte each had a 30 minute massage, which they loved. There was also a kids buffet at Catalina Kitchen on Saturday night that was adorable -- at their height, complete with warming lights. We liked it, didn't love it, but much of that was weather related. Out of state people should know that this location can be chilliy and is not a super hot beach vacation -- it is a good location for Disney, Hollywood and Southern CA exploration." "The outdoor fireplaces are the tell. They're everywhere. For a very good reason. If the coldest winter Mark Twain ever spent was a summer in San Francisco, he should have tried a late summer holiday weekend at Terranea in Palos Verdes - he'd realize he spoke too soon. What makes the resort special is its location - prime real estate on a majestic Pacific Ocean overlook of the famed Palos Verdes peninsula. What makes the resort problematic is its location. That same overlook, from all evidence, is a weather magnet. Fog and marine layer dominate the pattern here at land's end for the peninsula. You know when your kids don't want to hang by the pool or do endless runs on a giant waterslide, there's an issue. It's just plain cold - too cold for an end of summer celebration. Perhaps this is the place to be for Thanksgiving, but not when you're hoping to make use of that last spray can of SPF 50. As for the hotel itself, two years since opening its doors, its charms are seriously challenged by its deficits. This appears to be a place not yet equipped to handle its very occupancy. No less than an hour to ninety minute wait greet you at any of the "drop-in" restaurants the hotel offers as its options for families. It seems they don't realize that "ninety minutes" is not in most families' vocabulary in the wait department. This was a consistent theme over the course of the stay: lovely architecture, lovely spaces, but somehow overwhelmed by the very number of guests its huge footprint invites. The staff is warm and congenial - just...again, a bit overwhelmed. The Spa itself is more successful - lovely space, organization, and practitioners. As to the kids' experience, a similar story told as Amy's: facilities are by pre-reservation only, no drop-ins and no spaces for kids to hang out with their parents." Poshbrood recommends Terranea Resort for families seeking a luxe California getaway provided guests realize the possiblity of chilly weather and you book your restaurant and kids' club, spa, etc. in advance. We hope Terranea will work out the service and capacity kinks that are not acceptable in a luxury property at this price point. Nightly room rates begin at $300 for a resort view double room. Some pets accepted with pet fees.